Flow Tool User Interface has been updated improving ease of use. Documentation and SupportReleases Jackfruit Release Notes 2017-06-24Now able to hide/show Data Process rules in Flow Tool. 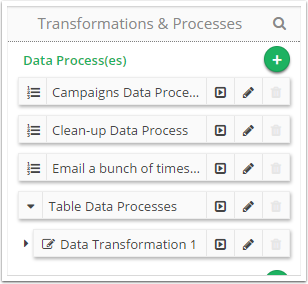 If you have a number of Data Processes on a Table, and each is comprised of many Rules, the Flow Tool can become cluttered. This could make it difficult to find a specific Data Process Rule. 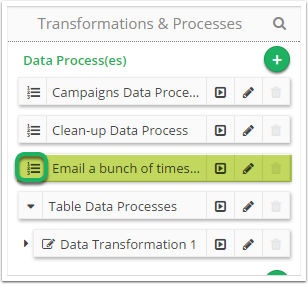 You can now specify which Data Process Rules are visible while using the Flow Tool. 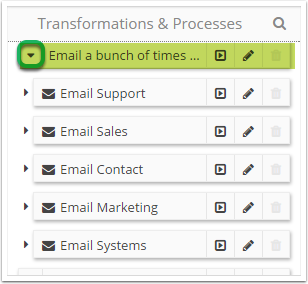 Locate 'Transformations & Processes' within the Flow Tool. Zoom: Locate Transformations & Processes. Click the arrow icon preceeding the Data Process you wish to collapse. The Data Process will collapse, hiding the individual Rules. 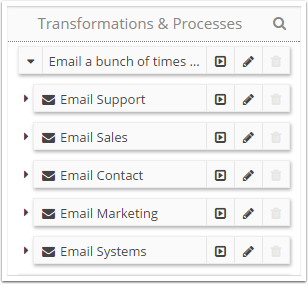 To show the Data Process Rules again, click the list icon preceeding the desired Data Process. The Data Process will expand, showing the Rules. Next: Fix Tool now enables 'With this value' or 'Without this value' Filtering using multiple rows.